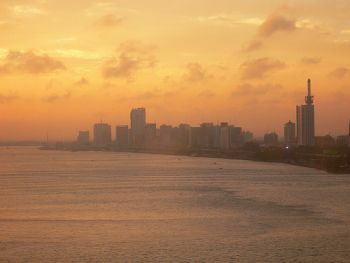 Lagos is the largest city and chief port of modern Nigeria. The area that is now Lagos was settled by Yoruba people during the fourteenth century. The founders created a coastal village they called Eko. In the 1760s, Portuguese traders settled there and began using Eko as a port for the slave trade, renaming it Lagos after the coastal city in Southern Portugal that had the greatest trading links with Africa. Profits from the slave trade allowed the ruler of Lagos, the Oba, to become the sovereign of a regional power. In 1851, a dispute between Oba Kosoko (and his deposed anti-slavery brother, Oba Akitoye, caught the attention of the British who occupied Lagos and reinstalled Akitoye. In 1861, Akitoye’s successor, Oba Docemo signed a treaty making Lagos a British colony. Under British rule, Lagos never became a fully colonial city. Commerce continued to expand and many European traders and missionaries came to the city, but there was never any mass European settlement. Lagos’ cosmopolitan nature was further enhanced by the arrival of thousands of white and black Brazilians in the 1850s. Throughout the 19th century the city was plagued by overcrowding and sanitary problems. While some early British officials such as Governor William MacGregor (1846-1919) attempted to improve the health of all of Lagos’ inhabitants, after 1900 colonial officials focused on the European areas. From that point the small European community was segregated and given preference in sanitary measures. In the twentieth century, Lagos became a center for resistance to colonial rule. Revolts in against water rates and the alienation of indigenous land in 1908 and 1911 served to unite native African elites and working class residents. The period between the World Wars saw further organization with the emergence of nationalist groups such as the Nigerian Youth Movement formed in 1933. In 1960, Lagos became the capital of a newly-independent Nigeria. In the years after independence the city’s population ballooned from less 100,000 in 1963 to nearly 2.5 million in 1974 as people were drawn in from the country seeking work, education, and freedom from ethnic and religious conflict. Unfortunately the ballooning population occurred in advance of the expanding infrastructure and against a backdrop of widespread corruption driven by new oil wealth. Severe overcrowding, congested traffic, extensive pollution and local graft and crime led Nigeria’s rulers to move the capital inland to the newly created city of Abuja in 1991. However, the complete transfer of power was not immediate and many agencies remained in Lagos. Today, Lagos remains Nigeria’s financial capital and, as home to an estimated eight million people, ranks behind Cairo, Egypt as the second largest city on the African continent. A. Oyewole and John Lucas, Historical Dictionary of Nigeria (Lanham, Maryland: Scarecrow, Press, 2000); Margret Peil, Lagos: The City is the People (London: Belhaven Press, 1991). People (London: Belhaven Press, 1991).